Horizontal TMR Mixers - I.H. Rissler Mfg. 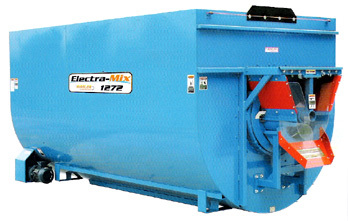 A Heavy Duty Mixer built for efficiency, safety and years of operation. Available in variety of sizes to meet the needs of most farms. 1/4" steel drum with stainless liner. Stainless steel auger trough. Reversing reel and auger. Variable speed auger. Hay knives spaced 12" apart for effectively processing dry hay. Gentle tumble mixing action. Dual mixing action; reel takes feed toward discharge end, auger takes feed away from discharge end, effectively eliminating dead spots. From models 55 to 400, the feed enters the heavy-duty auger at the left and right sides of the mixer and keeps the feed higher in the center as it blends. The feed spreads as it is carried towards the rear by the return chain. The heavy-duty chains with 1 1/2" high paddles blend the whole batch end to end. This insures very accurate mixes. The blender offers fast top loading of forages and grains, and easy unloading with an adjustable discharge chute. The blender can be started or stopped when full, saving energy and preventing unnecessary wear. Chrome plated knives spaced 4 inches apart allow you to cut and mix hay from small square or large square bales. Faster mixing and unloading speed. New baffle system eliminates feed separation. Wider magnet and discharge chute. Safety cable and safety bumper help to avoid serious accidents. Larger 11" discharge auger for faster distribution. Hydraulic door opener. Larger fuel tank - 2 1/4 Gallon on 18 HP with easy access to fill cap. 5 Gallon on 23 HP.